Eventually we arrived at an adobe home in the mountains above Santa Fe. The setting was very beautiful. The wind whispered prayers to God in the pine trees that blanketed the mountains in that area. We parked and walked to a large white tent that had been set up to accommodate the Holy Mother and the attendees. We put our pillows on a good spot up close as we had gotten there an hour or more early. This was on Michael’s advice. Get there early and sit as close as possible. The wind gently lifted the tent roof, first one side and then the other, with a soft whoosh like a great white seagull rustling its outstretched wings in the ebbing and flowing current of eternity. There was a beautiful calmness that dissolved the busy mind in the sure footed realization that there is no end... no end at all. Soon Amma arrived. Everyone stood up as she walked smiling, nodding, and beaming down the center isle that was formed to accommodate her access to the front. Maybe there were 100 people all straining to get a view of this short Indian lady with a great big smile. Those who were fortunate enough to form the inner wall of the isle and those behind them held their hands out to her as she passed their station. Amma’s arms and hands were out wide accommodating the gauntlet of fingers, hands, arms, and elbows that were reaching expectantly like prisoners in a cell block reaching out through the bars of the ego eagerly awaiting someone with the key to unlock the cell doors. When she reached the front, the first thing she did was to get on her hands and knees and bow to everyone with forehead to the floor. I didn’t realize it at the time, but that simple act of humility, love, and recognition of the divine in everyone was and is the essence of her entire life. After a short meditation, she started hugging the attendees. They formed a line and one by one, Amma would hug and bless each person spending several minutes holding, consoling, answering, and loving each one as though she were their own mother. Some were asking questions (an interpreter stood by her), some were crying with joy, some were curious and some were acting as though they had become blissfully intoxicated – oblivious to the beehive of activity that buzzed around Amma’s endless revelation of compassion. Occasionally someone would swoon as a result of being catapulted far beyond the world, the body, and the senses into the open space of divine love. Attendants would carefully pick them up and set them to the side until awareness of the world returned. Everyone was happy and smiling. Michael had already instructed us on how to ask questions. He advised that if we were to write a question on a piece of paper and present it to her, she would give an answer. With curious open-hearted anticipation Carlos and I fell into the darshan line each of us with our piece of paper in hand. At last, arriving at ground zero, I handed the interpreter the note as Amma pulled me to her lap. It was a rather striking experience. This very strange occurrence, being hugged by a little Indian lady whom I had never seen before, was somehow comforting and familiar. 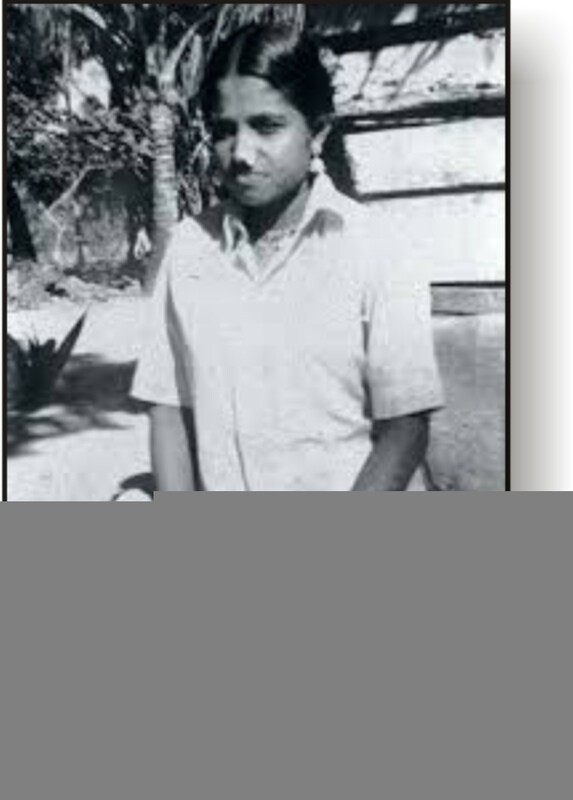 The interpreter relayed the note to Amma, which said that I was a follower of Ramana Maharshi and had been practicing self-inquiry and following the philosophy of advaita (non-duality). Did she have any suggestions for me? Gently, she pushed me back from “the hug” and gazed into my eyes for a few seconds. I looked back innocently and without preconceptions. The realization that I had stumbled into the Grand Canyon of the Spirit had not yet percolated up from the Center of the Heart to my dull yet searching mind. She had very kind eyes; definitely motherly eyes. She was reading me like a book. Through the interpreter, she began to explain and suggest for three or four minutes. She explained that practicing non-duality without devotion was like eating stones. It was dry and sterile. She suggested learning to cry out to God with intensity and love. Learn to cry real wet dripping tears for God. A deep longing for God should arise in the heart. Simply put, her advice was to immerse myself in devotional practices. I went back to my spot on the floor. My brow was deeply furrowed with lines of perplexed curiosity. What she advised was not fitting in like lambs don’t fit in with lions. Devotion was for sissies – those who were still drinking the puppy milk of spirituality. Devotion was second class. Devotion was dualism. There is not “two.” There is only one Self and therefore the individual I and other I’s are an illusion. There are no “others”. If there is only one Self, who is there to worship whom? Surely I was not a milk-drinking toddler. Surely I was ready for the straight-up spiritual whisky of the pure formless absolute. I reasoned that she had simply missed my greatness by not seeing that I was in possession of deep spiritual insight. I consoled myself by thinking that crying to God must be a general prescription handed to all. In truth she had seen that pride was one of my worst faults. I was too intellectual and Mr.-know-it-all was my middle name. Devotion was the perfect medicine for me because devotion meant bowing down and was not intellectual at all. Devotion meant the end of the ego. Carlos and I enjoyed a few more hours in the tent with Amma before leaving for the afternoon break. Amma would hug until 2 or 3 in the afternoon before retiring for the day. She would return in the evening for another program. We were enjoying the atmosphere. The incredible live bhajans (traditional devotional music) rolled and curled through the minutes and the hours like leaves and twigs in a beautiful and intricate nest in which Amma hatched her divine awakenings. “Well, Carlos, what did she say to you,” I quipped. I thought I knew the answer to that just like I knew the answer to everything else. It would be the same “generic” advice she gave me – do devotional practices. I was dead wrong. Amma had advised Carlos that each morning he should write down everything he was going to do that day on a piece of paper and what time he was going to do it and follow that schedule exactly. If she read him like a book then she must have read me like a book. Because of Carlos’s prescription, I had to take what she had given me as being tailored to my own needs. Through the evening program and until sleep claimed the day I pondered the question, “Who is there to worship whom?” The next morning, we arrived at the tent early to get a good seat close to the fountain of reality. 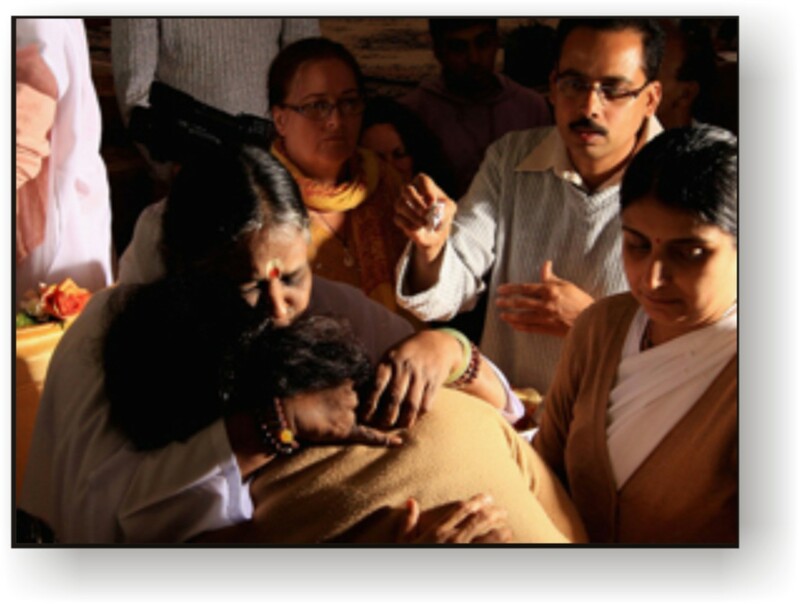 Watching Amma hug people was both entertaining and spell-binding. It was a spectacle totally foreign to anything I had seen or read. Because of this, one can easily sit for hours watching Amma give hugs especially if you are close enough to see facial expressions and nuances. It was the Universe, it was God, it was the Divine Mother, it was a roaring river of love, it was this cute little woman accepting each and every person and loving them completely with absolute compassion and caring. There were business persons, hippies, housewives, young, old, rich, poor – every flavor of human being was there. Each person got the same. Each person came to the cosmic theater of Amma’s lap with a brand new drama or comedy and no one went away empty handed. 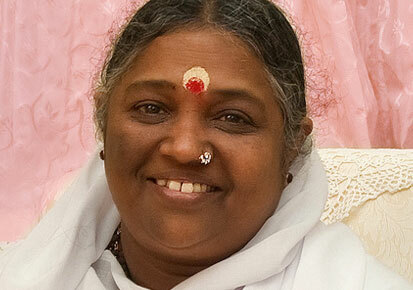 Watching Amma closely, it became obvious that she was spiritually intoxicated at all times. Everything was a delightful play to her. And how could she sit like that for hours and hours hugging endless streams of people and listening to their problems? She never got up to use the bathroom! To this day I have never seen her stop the procession of humanity to use the bathroom. On some occasions she has been known to hug for 24 hours non-stop. In the morning she would start at 10:00 a.m. and hug people until 1:00 or 2:00 p.m. She would start again at 7:00 p.m. and go until 3:00 or 4:00 in the morning. Day after day she would do this. The sense of awe regarding this selfless display of hugs and affection peaked as I reviewed the printed tour schedule. She would finish in one city at 2:00 or 3:00 a.m. and then fly to another city the next morning. That evening she would be at it again! This superhuman display of compassion goes on for months and years. What person could or would do such a thing? And why? There was not even an admission charge. No collection plate is passed. There is nothing to join. You are not required to pledge allegiance to anyone or anything. You did not have to be any particular religion – all were welcomed. Christians are encouraged to continue to be Christians. Amma will give Christians a Jesus mantra if they like. I have friends who have done this. Buddhists are encouraged to follow Buddha. Whatever our path, Amma’s only purpose is to strengthen it and illuminate it. She is a fountain of the living waters of life and we are free to satisfy our thirst with no questions asked and no strings attached. Absolutely nothing is asked in return. She is truly grace incarnate. 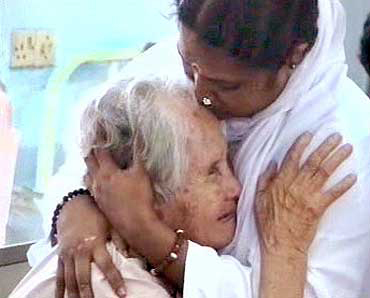 At the time of this writing, it is estimated that over the past 30 years that Amma has been doing this, she has hugged between 30 and 40 million people. That is such a staggering thing to comprehend. This is the single most significant indicator of her greatness (or her emptiness) even beyond the many instances of curing diseases, bi-location, and raising the dead (yes, Amma has done this several times). Most saints do not want to touch anyone at all. There is a scripture in the Bible in which Jesus is walking through a crowd and someone reaches out and touches him. Jesus did not touch all comers but only those receiving his blessing. Ramakrishna remarked that he had to be careful about touching people because he had to take some of their karma if he did so. He said this was especially true if the person gained any sort of spiritual experience or upliftment from being touched by him. Ramakrishna died of throat cancer in his early 50’s and he said the cancer was the result of touching others and giving spiritual experiences. Millions of people have had spiritual experiences while being hugged by Amma – she passes out these cosmic intimacies like so many candies from a bag. What sort of being is capable of such a feat? Only the Divine Mother of the universe. Only Parashakti Herself could do that. Certainly no human could even get so far as to forgo the bathroom stops. So now it was morning again and I found a spot to sit on the front row about five cushions to the right of center. As usual Amma came in that morning smiling and beaming as she walked down the aisle formed by the participants. She arrived at her sitting spot and promptly bowed to everyone with forehead to the floor. After meditation, she resumed her seat ready to receive the “hugees.” As she did so, she looked at the faces of those present with her warm radiant smile. A merciless icy chill had long ago gripped our hearts as the result of having wandered for too many years like refugees through the machine-like wasteland of egotism and the emptiness of sense gratification. She was like a red hot glowing potbellied stove of radiant divine light and love. As the ancient ice melted from our hearts, it ran as raging rivers of fiery tears down our cheeks. Until now, most of us had never witnessed or felt such pure unconditional love. As she sat on her stool, her smile was like a World War II search light scanning the sky of our faces amidst the darkness of our own ignorance. She scanned first to the left side of the room and then slowly to the right and finally to where I was sitting. I was totally unprepared for what happened next. Our eyes made direct contact. It was electric; it was explosive; it shattered time and space. Her look was mischievous, childlike and innocent yet direct, piercing and illuminating like lightning. Her look was a gleaming razor sharp machete that cleaved the hardened coconut shell of my ordinary perception in one deft blow. Suddenly her eyes became vast and open windows through which I could see directly into the heart of eternity. I saw and felt incomprehensible love and compassion far beyond anything I had ever seen or even imagined. It was a love as vast as the ocean of existence itself yet intensely intimate and personal. It was compassion so enormous as to swallow up the entire universe and all of its beings. Prior to this “look,” love had only been a four-letter word. Compassion had only been an intellectual concept. 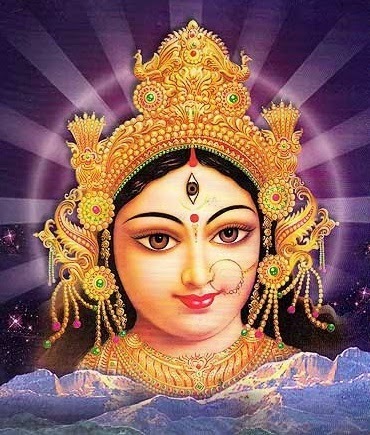 Intuitively I knew that I was seeing the Divine Mother of the universe. I was experiencing Her directly. This is far beyond the physical form of Amma, which was simply a mask the Divine Mother had assumed in order to appear before us with boundless hugs, love and compassion. 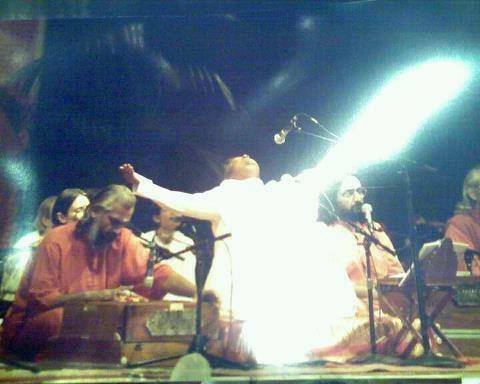 I understood that anywhere and anytime compassion and love were expressed, the Divine Mother Herself was there. She is compassion and love. In the Bible, Saint John tells us that God is Love (1 John 4:8). I understood that Amma was helping me with my dilemma. She was showing me how to begin to follow the advice that she had given me the previous morning. Accompanying this experience was the understanding that the Divine Mother had created every aspect of the universe – every human being, every rock, every blade of grass, every creature, every star, everything – as an embellishment to, or an offering for, the pure formless Absolute. Her devotion was so intense that She created everything as a love poem, a painting, as music, and as an expression of Her infinite adoration. This has been going on without beginning or end. 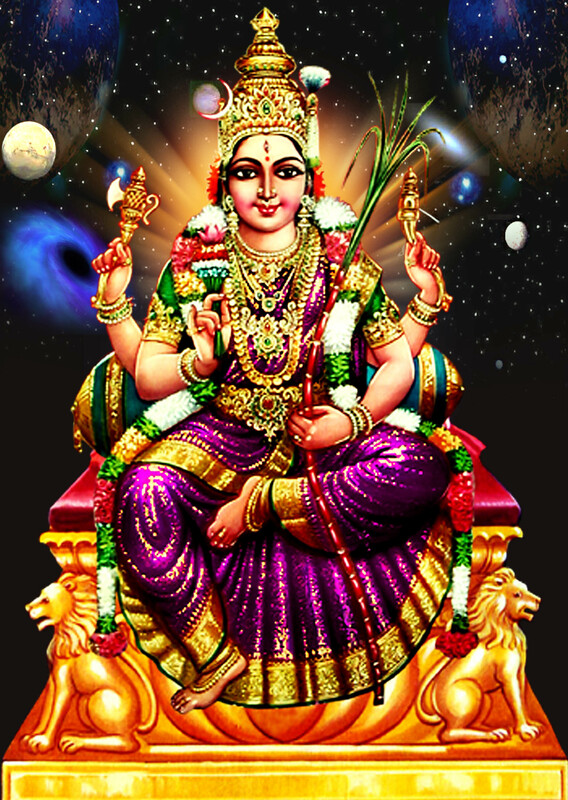 The Divine Mother was and is the Primal Devotee. The Divine Mother had revealed Herself to me and I was to meditate on Her. For the time being the question, “Who is there to worship whom?” was forgotten in the maelstrom of God’s timeless love. The conclusion here is that God is both male and female because his image is both male and female.